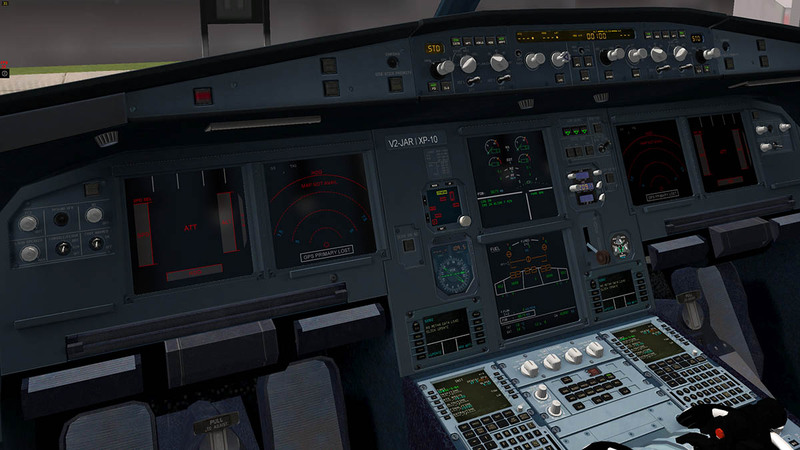 JARDesign has now released Version 2 of the Airbus A320neo, this update covers more new features and more even more depth to the systems. 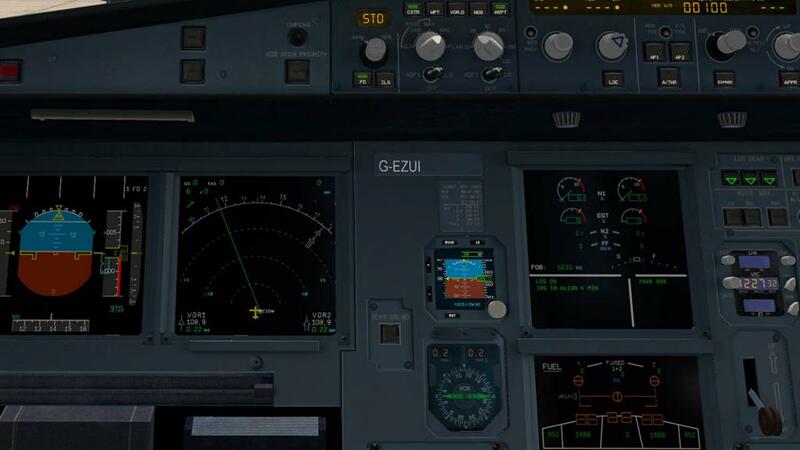 In that the update is mostly focused on giving more detail on the PFD (Primary Flight Display) and auxiliary instrument items like the ISIS ( integrated standby instrument system) and the DCDU (Data Communication Display Unit). 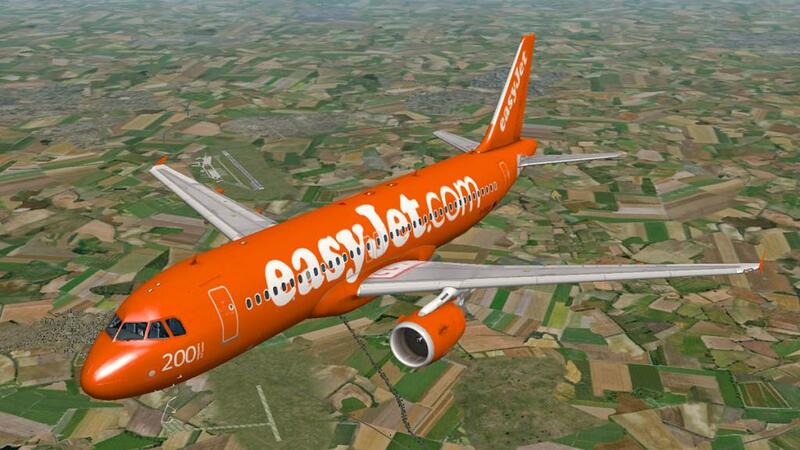 Outwardly the A320neo v2 is unchanged, The modeling is excellent and the A320 is an excellent aircraft to enjoy. Detailing is very good and you can have the choice of the original wingtip devices, or the new "neo" Sharktlet version. I still like the original and that is what I have flown here. 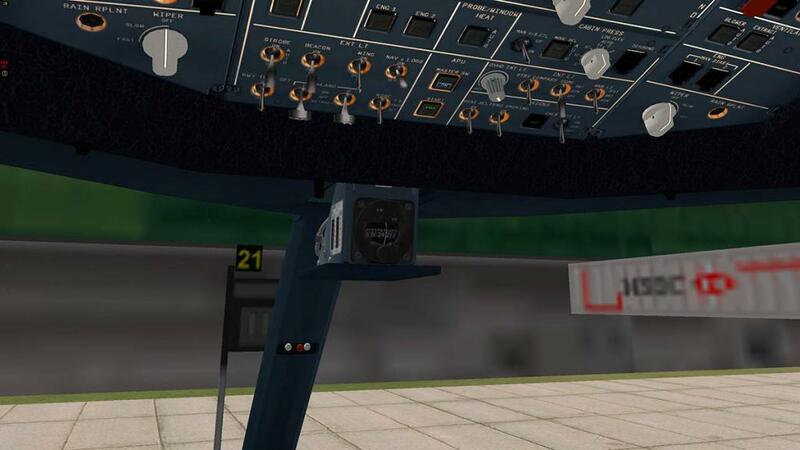 (You can change the different wingtip types in the MCDU (Multifunction Control Display Unit)). The first noticable change in v2 is a Fr (Framerate) counter above the menu tag on the left side of your screen. It can be handy or an irritant depending on your mood swings. I use the "Discrete Framerate" counter plugin (Very top - left) that can be hidden when required. But I can't find a way to hide this version. The menu is again comprehensive, with load and weight factors and refueling amounts that are loaded via the tanker provided. 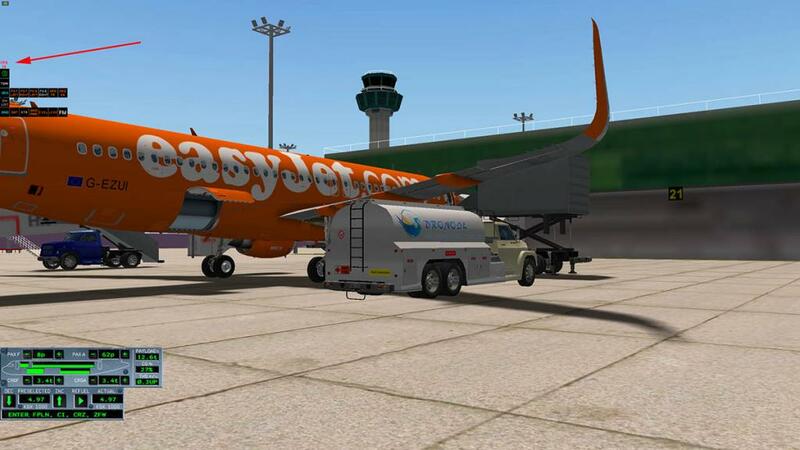 Just make sure you do this because it is the only way to put fuel into the A320, the X-Plane menu version does not work. 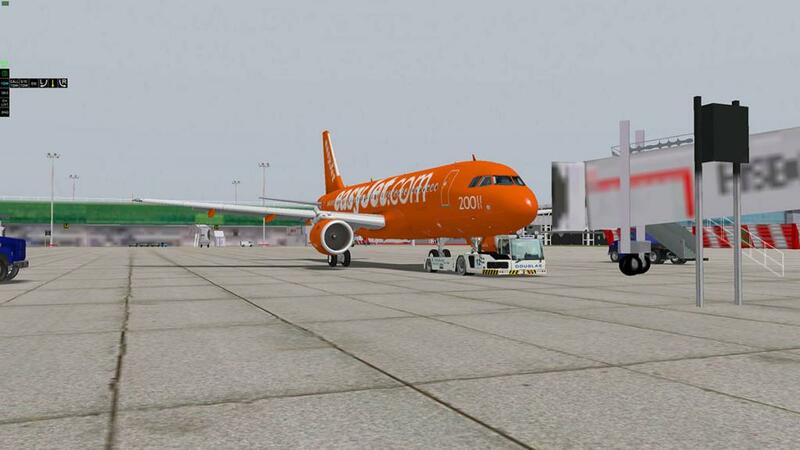 Startup is a long process on the JARDesign A320. You align the aircraft and wait while the systems bring themselves on line. As simulation goes it is one of the best, but annoying if you want to reset the aircraft to another location or worse just restart. The cockpit looks like it has had a light touch over, The OHP (Overhead Panel) looks more well lit and detailed, but the frame-rate looks far better as well with the changes. 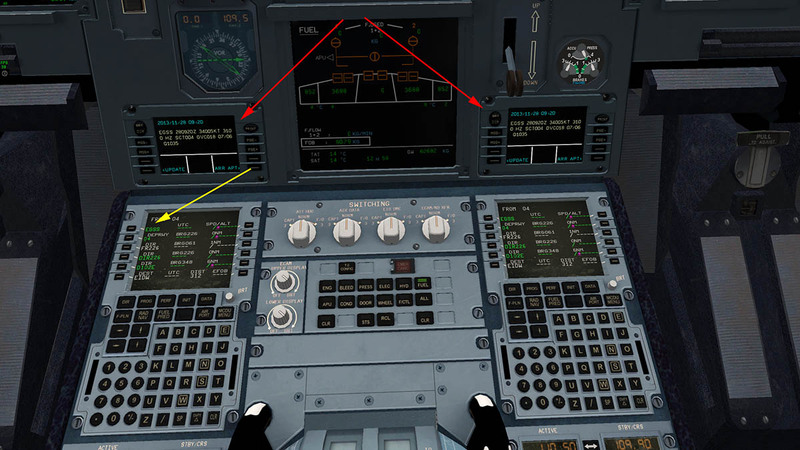 You can easily change the Aircraft Registration on the panel to the one you want. 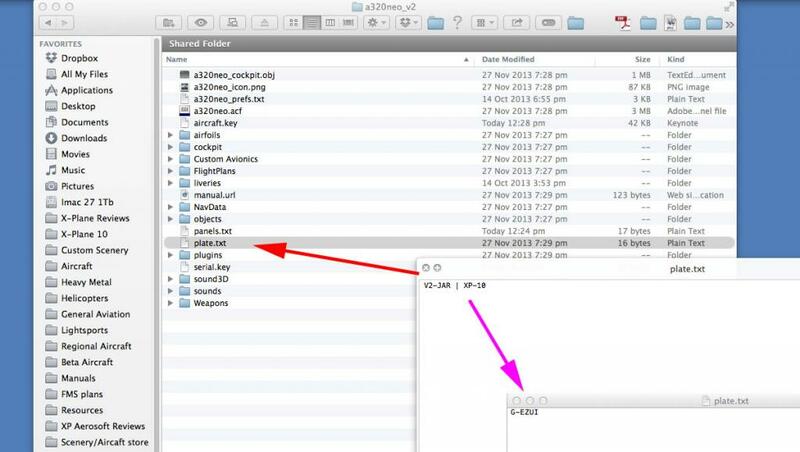 In the v2 Aircraft file is a "Plate txt" file, that can be changed to the rego you want via a text editor. 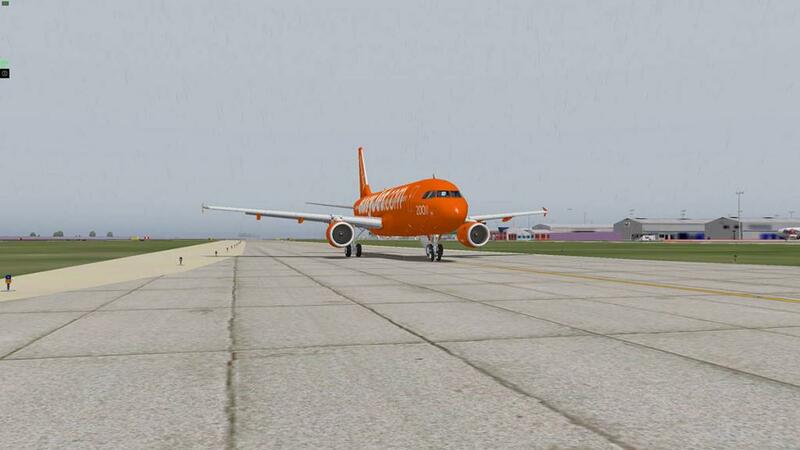 Just be careful to do this before starting up X-Plane as it can only be changed before opening the aircraft file. If you start the aircraft up (like I did) you will then have a long restart to just get back where you were originally. The ISIS ( integrated standby instrument system) is now excellent and very detailed, The idea of the ISIS is to combine all the functions of an altimeter, airspeed indicator and the attitude indicator, into one instrument. It is primary used as a standby instrument to cover any electronic panel failures. There is now a compass that drops down from just in front of the top of the windscreen pillar. Highly detailed it a clever addition. There is also a clever DCDU (Data Communication Display Unit) instrument. There are two situated above each of the MCDU's (Multifunction Control Display Units). 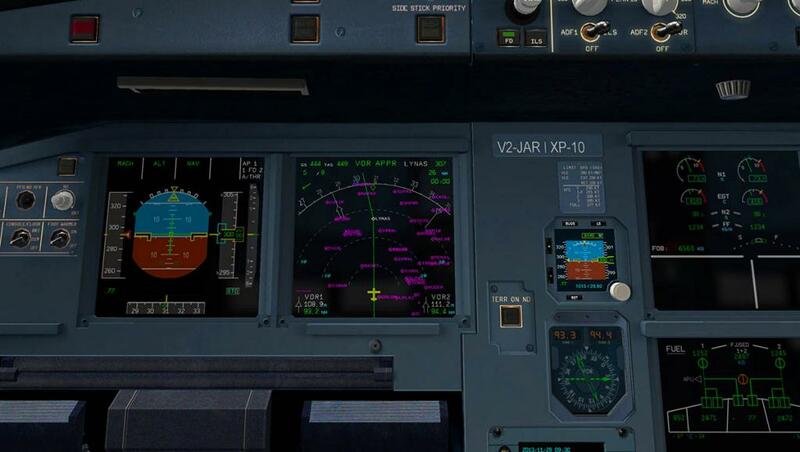 This instrument can show weather (metar) information at your departure and arrival airports. For it to work you have to program the MCDU (the Dep/Arr airports) so it can access the data. It is very clear and an excellent tool. The MCDU's are however fixed together, in that change one and the other will change also. You will notice the time to get the aircraft ready for flight. I have mentioned this before in that you will need to be patient in setting all this data up, and including the programming of the route into the MCDU. It is very involved and it also very time consuming. and certainly if you are creating a new route from scratch. Forward planning will help if you intend to fly the A320neo a lot, but for a once off quick flight, you may find it slow and frustrating to get airborne. The pushback truck is first rate, but a little fast. I like the design of the truck and the handling is easy, but I miss the throttle and speed selection of the Flighfactor truck. 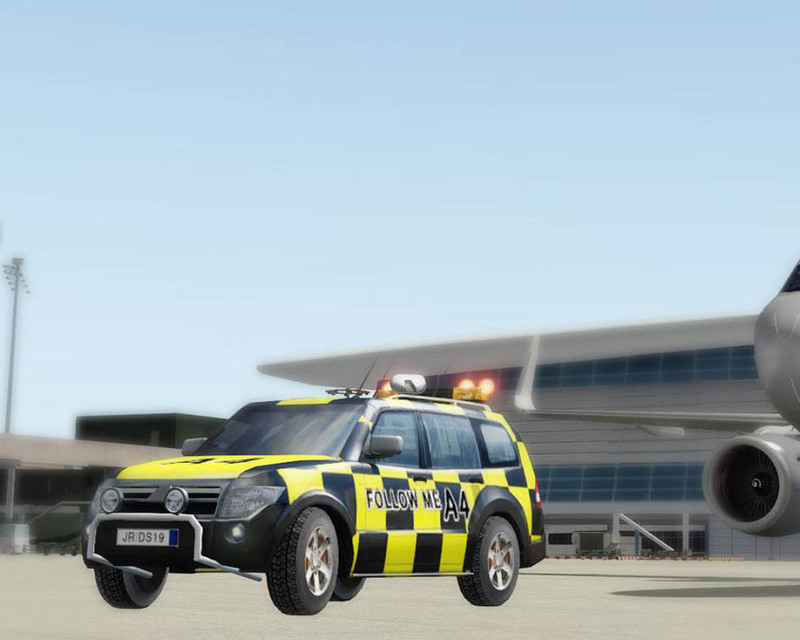 The follow-me car is now included with v2 (I covered the Follow-me car in detail in the post " ". Another new feature is "Rain". 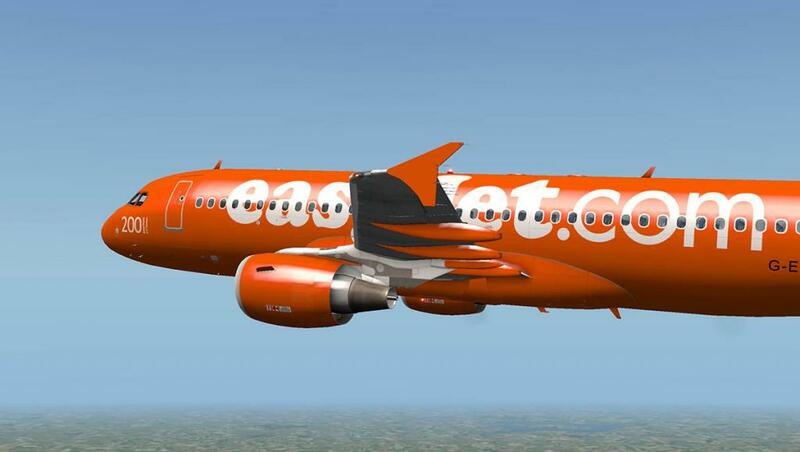 Most high-end payware aircraft now feature this addition, and now it comes to the A320neo. As spots and dribbles go they are excellent. They plop down and run down your windows. But the wiper(s) do not clear the screen for you? 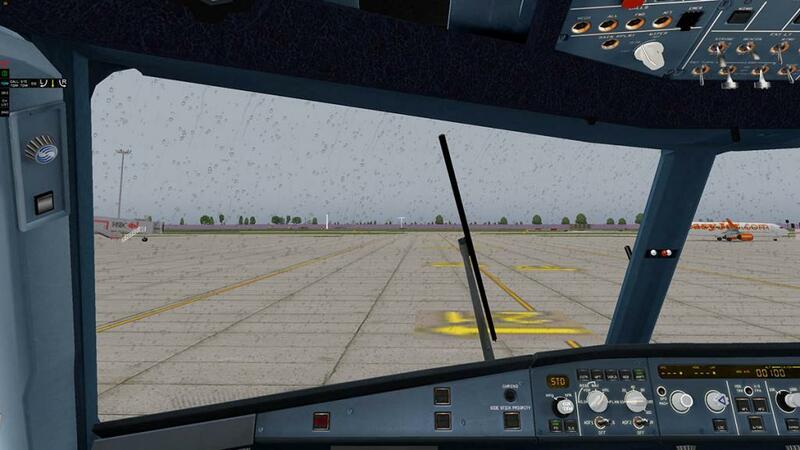 Which is a shame as the wipers are independent and realistic. 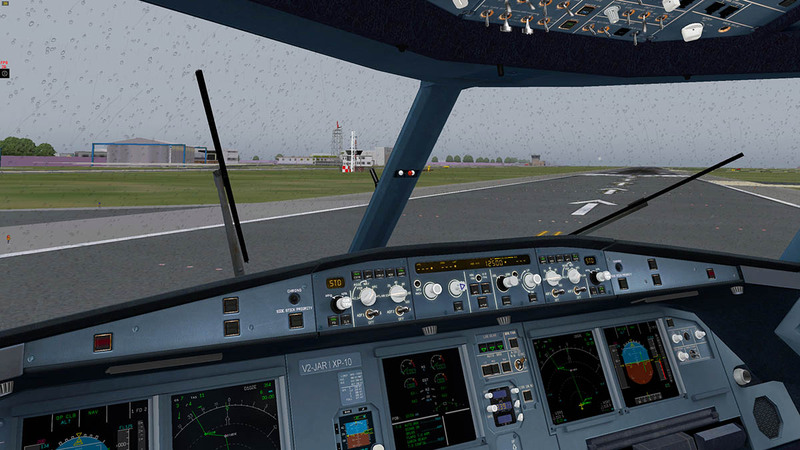 While taxiing you can feel (and see) another new feature. The "Camera Shake Effect". Touch the brakes and you dip down, but not totally with the aircraft. It is a shake effect that gives you realistic bumps and movements - and it is very good. An older feature that is activated by the "Terr On" switch are the ground maps. These are simply the X-Plane ground maps, but they are excellent for finding your taxiways and your route around the airport. 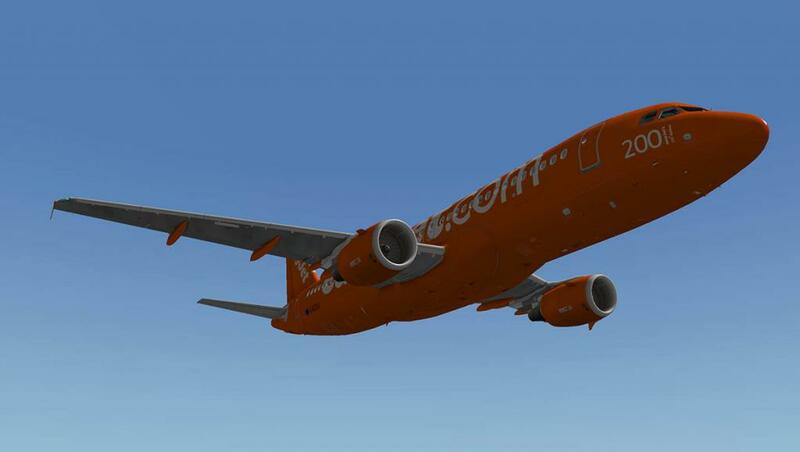 Flying the A320neo is very involved. A pure Airbus in its systems and flying capabilities. 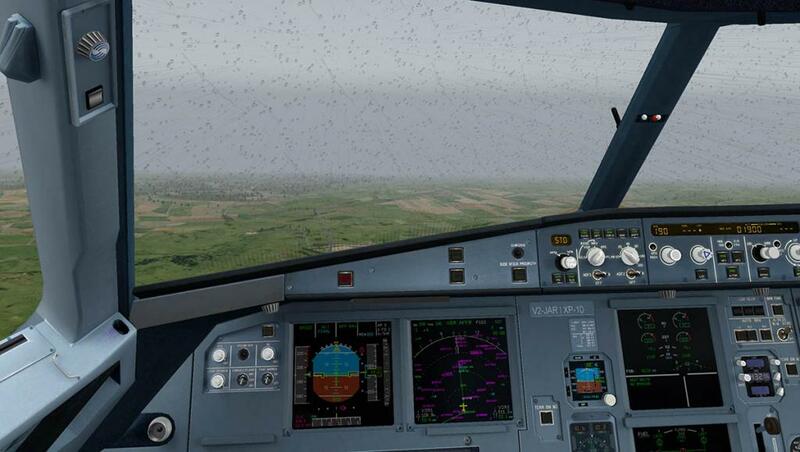 It is not an easy aircraft to fly until you really adjust to its systematic approach. To not touch the speed knob is hard when you like to set certain speeds at certain points of the flight. But it does it very well here. you get a lot of alarms if you are not on top of the aircraft, so time spent learning is worthwhile to get a smooth cockpit flow of actions. In v2 the PFD (Primary Flight Display) has been redesigned and on first impressions it looks not that much different. But it is and you can see the quality in both the PFD and the MAP display with the shadings, reflections and the amount of data now displayed. 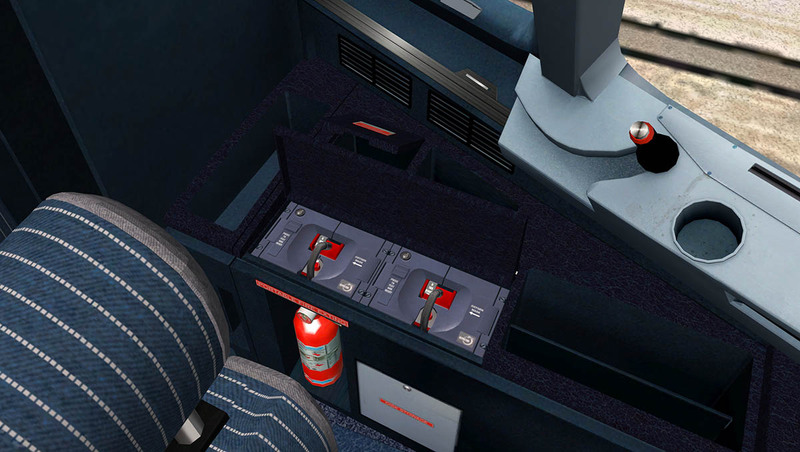 Another feature is the oxygen masks that are stored down by the side of the pilots (and co-pilots) seats, you have to flip the lip to see the fittings inside and you can test the system with a whooshing sound, A note is that the rubbish container above opens as well. Sounds are all round excellent, but do need to be adjusted via the "MCDU Menu" as they are a set a bit to low a volume. 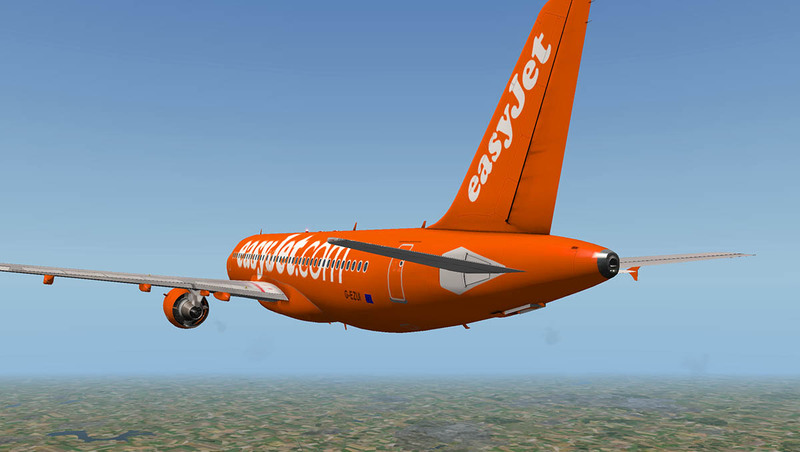 It all comes together really well, with like in this instance on approach to EIDW (Dublin RWY10). The weather turns nasty at low cloud and the raindrops appear. The shaking gets violent as we pass through the cloud with the "Camera Shake Effect" (Can be turned off in the "MCDU Menu") but then the rain goes into a cross pattern that looks not very believable for a moment?. The wipe away (raindrops) effect however is very good. 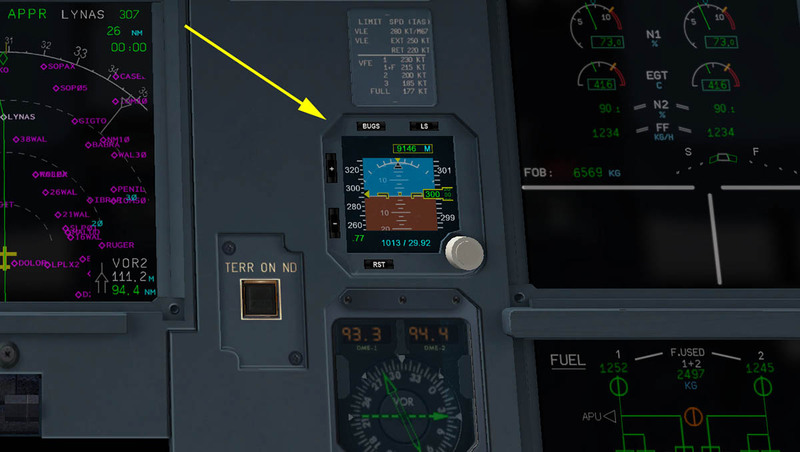 The PFD and the MAP displays are very good with the ILS Function now active. One thing I did notice is that your speed depends on your height. I was down to the approach height of 1800ft and my speed was too high to drop the flaps (It tells you, you can't do that?). To get the flaps down I had to come out of the auto mode to set the speed manually to get the flaps down before collecting the glideslope. (Okay I chickened out? ), no doubt that as you went down the glideslope the speed would have dropped accordingly. But it made me nervy as I felt you are going to fast. Just an old (Boeing?) habit really. 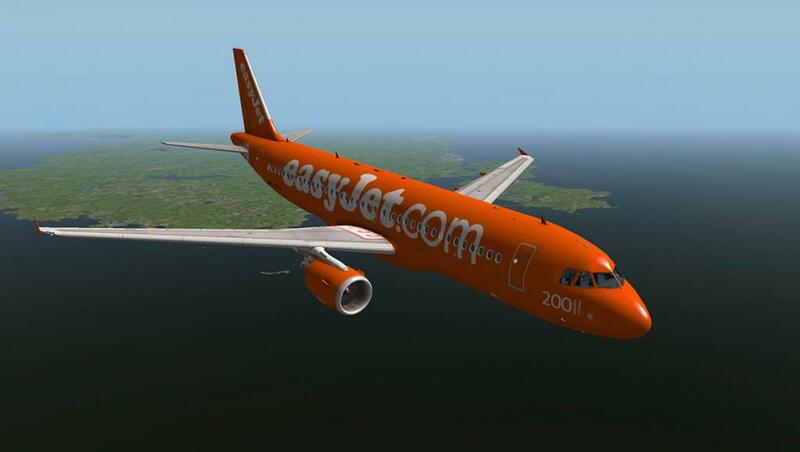 One of the big achievements of 2013 has been JARDesigns continual upgrades to this aircraft. It is not totally perfect yet with still no manual setting of the throttles, flaps and the arming of the brakes for landing and a few other items. There also needs to be more information on how to use all these features. 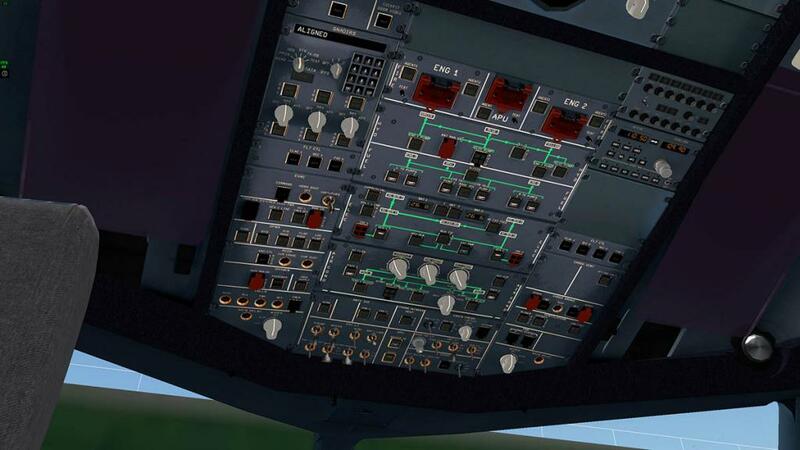 The aircraft is getting very complicated and you now need some help in navigating the settings to get them right for the correct insertion of MCDU and the best way to fly the aircraft and its systems. 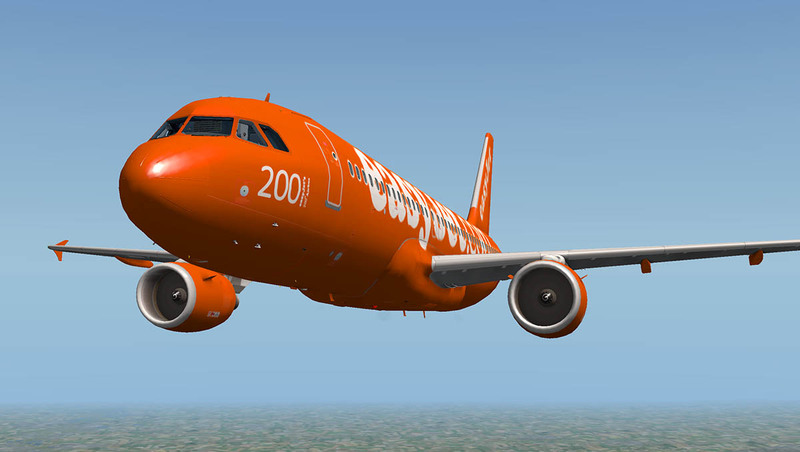 The JARDesign A320neo is certainly one of the most comprehensive aircraft in X-Plane, highly detailed and with some great features. This v2 update takes it a lot further as a great simulation. It has come a very long way in 2013. And this is certainly a great investment. A final word is that it requires time to start up and fly, but it is very worthwhile in taking the time to do so. Excellent review, well done. regarding the annoying little fps counter there is a way of getting rid of it. I did have to write into the jardesign support forum to find out. It would have been much better to have an off on switch as I find FPS counters the bane of most simmers lives as they try desperately to increase FPS into the high hundreds or some such ridiculous number. Anyway this is how you do it.